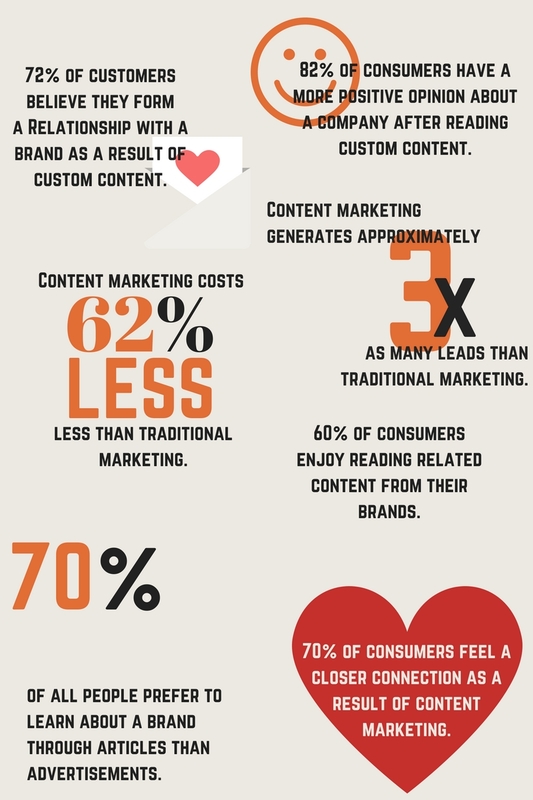 Content marketing is defined by Google as “a type of marketing that involves the creation and sharing of online material (such as videos, blogs, and social media posts) that does not explicitly promote a brand but is intended to stimulate interest in its products or services”. Since the dawn of internet marketing, people have stood by the statement “Content is King”, which roughly translates to providing consumers with original, organic, and authoritative content that drives traffic online. Sites like Buzzfeed, Reddit, and Tumblr excel in producing content to drive traffic. In addition to that, 70% of B2B marketers will incorporate more content into their marketing strategies during 2017. E-commerce websites that utilize content marketing see 3x more leads and 6x more conversion rates compared to sites with no content strategy. We think content marketing is important to a comprehensive digital strategy, but not everyone shares this belief. These people declined to dedicate the resources necessary to improve their content online because they don’t think it’s an important enough strategy to invest time and money in. It’s no secret that Google prioritizes well researched, informative content. They emphasized it in 2015 with their Search Quality Evaluator guidelines, which–if you follow these guidelines– could increase your PageRank. Google lowers the PageRank of sites that produce poorly written content or content that lacks the required expertise the subject demands. So don’t be shy, showcase your knowledge! Be genuine, and Google will love you for it. The growth of social media has made video content a more viable and applicable option in 2017. A recent study by Cisco predicted that by 2020 video will contribute to 80% of online traffic. If this continues to hold true, video content will be a major pillar of any solid digital marketing strategy. For example, the online retailer Ariat saw a 160% spike in their conversion rate on pages that featured videos. Check out the results that video content has made for other online retailers. Live videos are also seeing a rise in prominence in the social media age. Facebook Live, Instagram, and Periscope has made mobile live streaming a hot trend in 2017–so much so that Facebook announced that people watch live videos 3x longer than videos that are not. Platforms like Instagram and Twitter are making livestreams a focal point in content strategy. 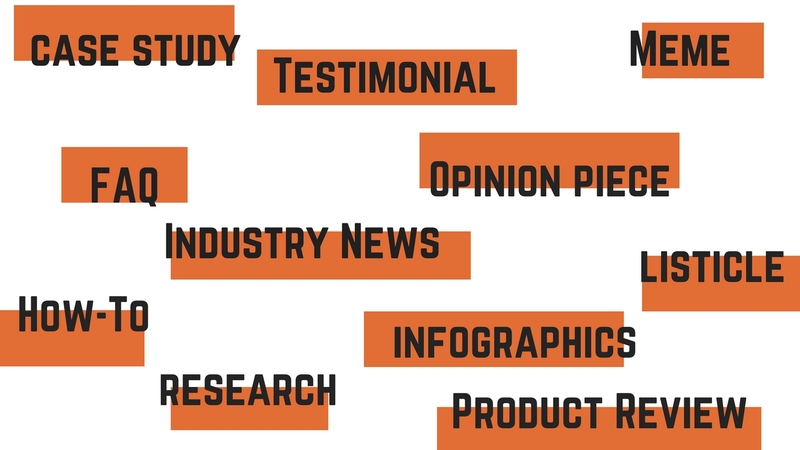 A newsletter is a wonderful way for a brand to interact with their customers and to maintain a brand’s tone and message. 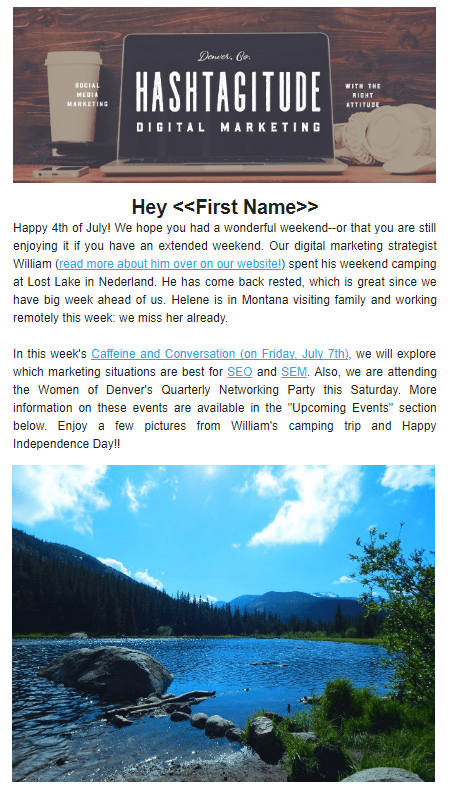 Newsletters are also excellent for sharing information in a personable way. 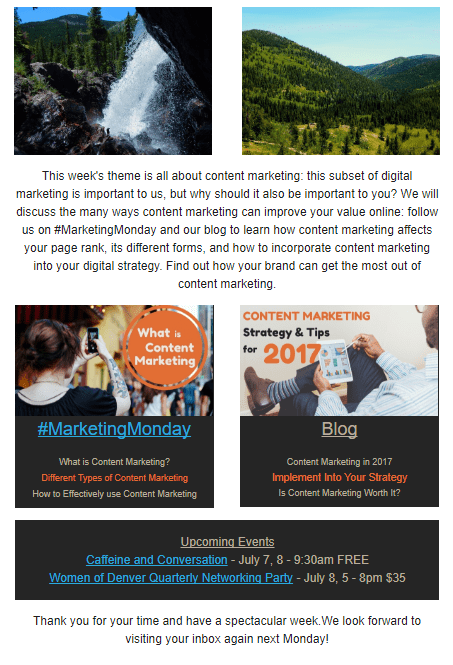 It’s important to create digital newsletters that are optimised for all viewing devices nowadays since people are accessing the internet now through various mobile devices. Don’t forget to include a call-to-action, which gives readers a direction to follow after consuming the newsletter’s content. With our newsletters, we like to give readers with an inside look into our lives, a schedule for the upcoming week, share company news (if applicable), and remind readers of upcoming events. Inc. Magazine puts the emphasis on influencer marketing beautifully: “potential customers you’re looking to attract would prefer to hear from you, not from you”. The “not from you” part is key. 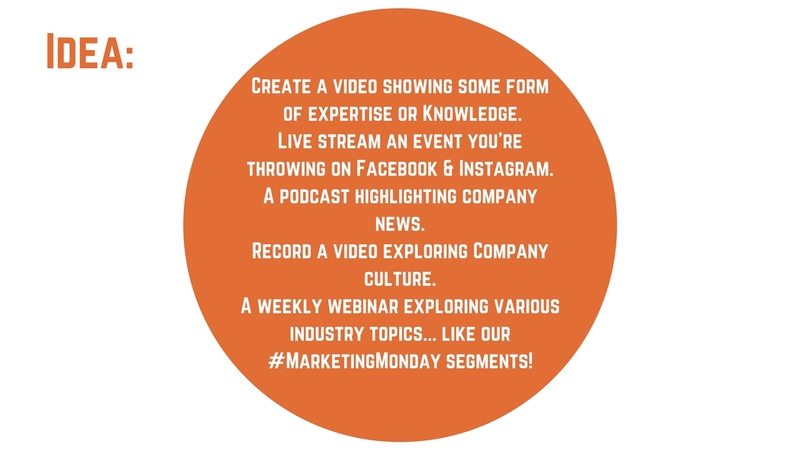 We discussed Influencer Marketing on last week’s #MarketingMonday and blog post. Influencer marketing attracts customers in the age of ad-blocks and consumer immunity. Influencers help to humanize advertisements, especially when relationship building is a growing need for every brand. We covered into numerous ways to use influencer marketing to your advantage in a blog post that you can read here and here. It is yet to be seen if content is truly the “king” but it sure makes an interesting case for itself in this digital age. Whether this style of content is one you can subscribe to or not, we wanted to give some foundation to possibly incorporate it into the remainder of 2017. Don’t forget that content marketing is about connecting with a targeted, specific audience instead of a broad audience.